I have talked about the recent criticisms towards jazz in my previous blog, "Is there a problem with jazz?". And one of the many criticisms is that the audience is dying out. Yet, after being at the Montreal Jazz Festival for the past couple of days, I must say that this idea of jazz as a "dying art form" is far from the truth. Everywhere I turn, I have heard music, seen people smiling, dancing, singing, and relaxing to the music. People of all ages come here- babies in strollers, parents, middle and high school kids with their friends, elderly people with a spouse- and people of all nationalities. There are crowds of people, selling out concert venues, packing free concerts, and walking around enjoying the scene- not listening to jazz because it is a "lost art", but because they are having fun. Today was another fun filled day, but I would say any day spent listening to and talking about jazz is the best kind of day. Once again I started the day by going out to lunch, and hearing some of the many free concerts. The Montreal Jazz Festival has many booths to take pictures, or to win prizes. 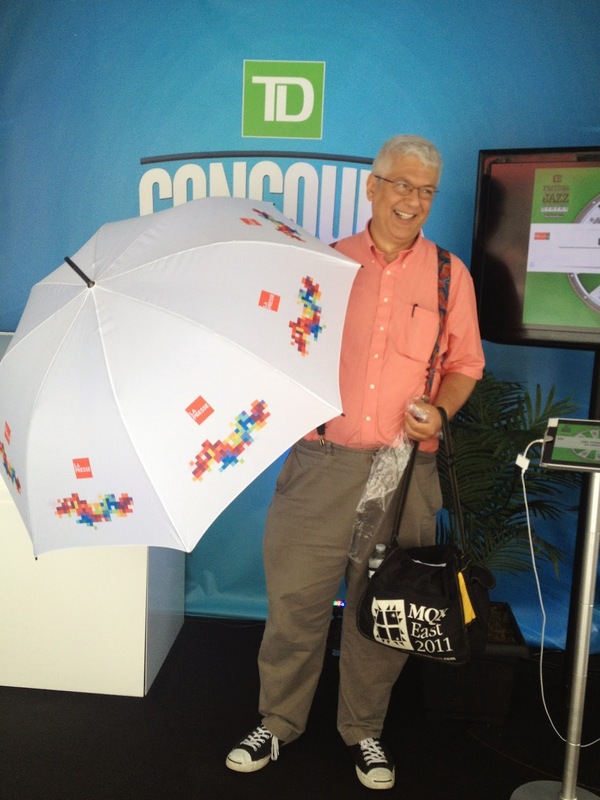 My dad and I went by a booth, and my dad was lucky enough to win an umbrella. I watched a local music oriented high school big band play at an outdoor concert. The group played a collection of standard big band charts by Count Basie, and Herbie Hancock. The band director was very proud of his students. Afterwards I heard a jazz combo play various jazz standards like "Birdland". I was impressed by how the Montreal Jazz Festival tries to have music outside at various venues throughout the day, so if you are walking around the streets or eating at a restaurant you can still hear music. Later in the day, I heard "Le Dixieband", a dixieland band, play a collection of old time favorites like "Royal Garden Blues" or a selection by Sidney Bechet. The group was amazing, and the clarinetist hit some high notes that I did not even know existed on the clarinet! At one point, it was an audience member's birthday, and the group started playing for him! I love Dixieland music, especially after seeing "Preservation Hall Jazz Band" perform twice- once at Newport and once at the Copley Hotel in Boston. Dixieland music is energetic, danceable, and bright. I loved when the group played "Royal Garden Blues", a song that I have played on numerous occasions. Afterwards I visited the press room and noticed the poster on the wall signed by various jazz musicians from this year's festival. Christian McBride, always a jokester, wrote "Bring the Expos back!" (Montreal's baseball team). Following this, I listened to more free concerts in the mall, and had dinner. My dad and I visited the Jazz Art Gallery inside one of the venues of the Montreal Jazz Festival. 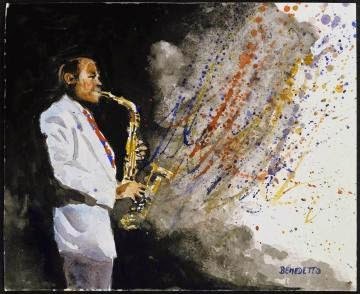 I saw many paintings, drawings, and illustrations- both real and abstract depictions of what jazz looks like. I went up to this lovely painting of Charlie Parker and was amazed to find out that Tony Bennett painted it! I also saw artwork by Miles Davis and Jimi Hendrix. These greats really show that an artist is not limited by their profession- you can express yourself in a multitude of ways. Then went to Club Soda to hear Matt Anderson. Matt Anderson is a Canadian blues guitarist and singer-songwriter. I enjoyed the emanational rawness of his music, and the vocal quality of his guitar- he would add inflections such as bends and scoops to build intensity. Anderson's band featured a full horn section, with tenor saxophone, trumpet, baritone saxophone, and trombone. The horns often received improvised solos, which was nice to see an intersection between blues singing and more jazz influenced improvisation. Anderson had a rich voice, capable of runs, leaps, and immense dynamic contrast. These capabilities allowed him to tell a story to the audience, and he would often share the story behind a song. 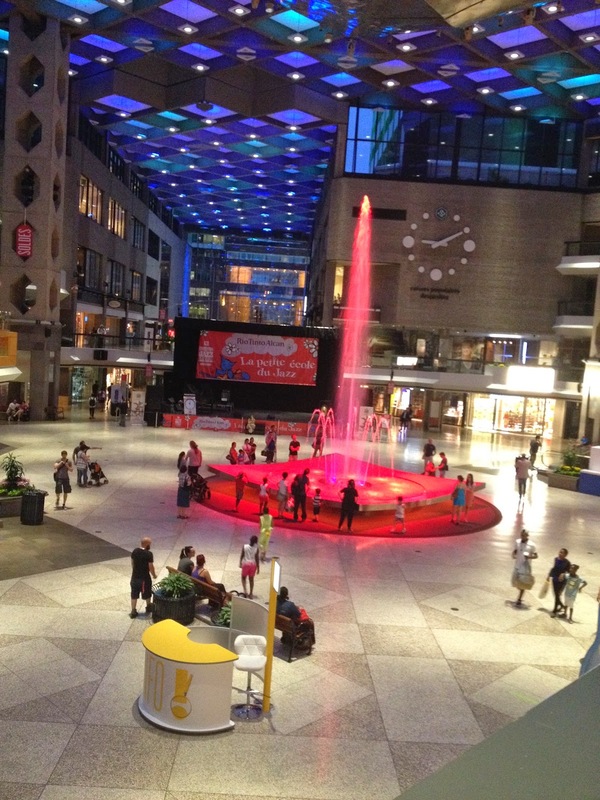 Following Anderson's concert, I went to the mall at the festival, where there is a stage for music and a beautiful fountain. 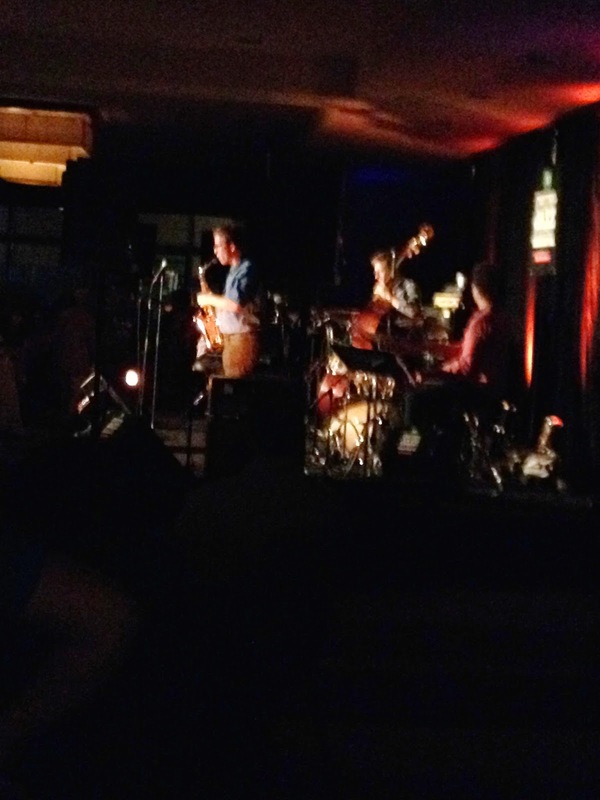 Lastly, I went to observe the jam session at the Hyatt hotel again. The house band played a tune, then allowed some musicians from the crowd to come and sit in. The people that sit in on a jam session normally play jazz standards, or repertoire that many jazz musicians know and have memorized. It is like a common language to start with while communicating with musicians that you just met. Jazz is not "dying", or if it did, it has been reborn. At the Montreal Jazz Festival music is everywhere and people are celebrating life today. And with this celebration of life today comes the celebration of the lively music labeled as jazz that emanates from every corner of the city. No matter any bias about the music, this music is filling the streets with happiness.